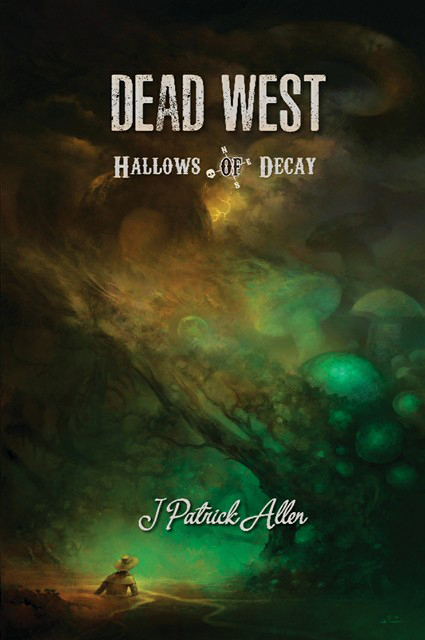 The next Dead West book is only weeks away! In celebration, you get a sneak peek at the cover for Hallows of Decay, as well as its opening chapters. I could begin to gush about how hard this book was to write and how proud of it I am. I could talk about all the amazing people who helped make it work when I was certain it just wouldn't. This is also your reminder that West of Pale and Bond of Blood's ebooks are still on sale for $0.99! Safety and trust are such rare commodities in our business. Back then I was so naive, willing to believe anybody, but there were things on the horizon that would sorely temper my credulity. On that picturesque summer day there was no doubt in my mind the peace and calm I felt would last forever. The sky was the kind of blue you see on fine silk dresses, with little shining pearls of clouds sewn sparsely across the heavens’ bosom. It was late in the summer now, and we were in the high country. The air was the pleasant, toasty warm of a swallow of smooth bourbon. Grasshoppers played their fiddles, hidden by the knee-high grass on either side of the trail, and the world smelled like a fruitful summer. Even Samuel, my mentor, was in a good mood. He rode beside me instead of ahead of me, streaming a thin banner of spicy smelling smoke from the long, thin cigar he favored. He would chew on the cigar’s end, whistle to himself, and mutter encouragement to his nameless horse. I was apprenticed to Samuel to learn the harsh ways of monster hunting. During long rides like this, the game would go on for hours. Without turning an eye on me, he would tell me to put my books away, for I was always in the habit of reading in the saddle, and would begin to quiz me on our trade. It had been this way ever since we’d fallen into this arrangement in 1871. “Well, no…” My cheeks heated again, and I hunched my shoulders. At length the trail connected to a broader road. It ran alongside a flashing stream of water a good thirty or forty feet wide, but perhaps only four feet deep in the middle. Its banks were flush with green grasses and short trees. The water had an almost emerald quality when it caught the sunlight just so. The Green River. Which meant we were nearing our next stop. Buttes—immense rock teeth, banded in red and gold—gnawed at the horizon. Resting at base of their slopes, only a few miles off now, was the town which shared the river’s name. “After a stop for supplies,” he said. A month past, we sat at a table in a little Kansas saloon, drinking to a hard-won victory with two other of Samuel’s brothers of the Charlotte Knights. The undying train robber Barker Raleigh’s reign of blood and fear had been brought to its grisly conclusion. Through a questionable deal with a duke of Hell, we had discovered the means of ending his unearthly boon and laying him in the ground forever. As we raised a toast to the fallen we were approached by two men in neat black suits—Mr. Heywood and Mr. Lodge, gentlemen claiming to represent a government agency called the Culper Ring. They claimed to have been following the Knights for some time, displaying a remarkable depth of information regarding our work and travel. Then they diffused the tension by offering to pay us for work we were already doing…with the stipulation that they would occasionally direct us toward situations that needed handling. They provided us each with contracts for work, then as a measure of good faith they granted us a bounty for the already-dead Barker Raleigh. Ours involved an upstart mining town, Silverton, somewhere in Yellowstone country. Word was, the town had mysteriously vanished. Anyone who went looking for it, likewise, disappeared. That was three weeks back, late in the summer of 1872, and I was fourteen years old and living in the saddle. We traveled by train and on horseback; stopping only briefly to listen to rumors, pick up supplies, and once to rescue an honest-to-god unicorn from a traveling circus. I pulled a little notebook from the pocket inside my jacket. Daniel Garner, another Charlotte Knight had given it to me. He had advised me to keep notes on everything I observed regarding a job. Flipping past dozens of pages about Raleigh and his gang, I settled on the scant two pages I had regarding our current job. Most of it was conjecture or rumor. Indians, bears, one man said everyone packed it in and looked for other claims. Sensing his tension, his horse picked up pace. To keep up I nudged my ash-hued quarter horse, Dasher, up to speed with him. I bit my lip. I almost worried about asking the next question again. A chill ran up my spine just remembering the gaze of those two. Misters Hayward and Lodge. Something about the look of them made me feel uneasy, even six months after our meeting in Hays. Conquer Cholera ~ Bushwhack Buboes ~ War upon Wasting! I waved my hat to the man, presumably Dr. Quillburn as we rode around him. He gave a friendly tip of his bowler, and I turned beaming to Samuel. He scowled in the direction of town, saying nothing. I sank a little, and we rode in silence until we reached town. Weeks past any decent sized community, Green River delighted me. Wives gossiped over laundry while children dashed around horses and chased hoops. Cowboys, cattlemen, and gun fighters shared the dirt packed streets, eyeballing enemies and saluting friends. Most of the buildings were new-built and freshly painted, and many of the stores and restaurants even had glass windows. Samuel took us along the main drag, eyeing dry goods stores, general stores, and tailors. This was his ritual whenever we entered town. Samuel would ride up and down the street sizing up each of the shops until he found the right place to spend his gold: a place poor enough to haggle a good price, but not so hard-up as to carry bad goods or try to cheat a man. We moved past regal false fronts with freshly painted scrollwork signs, and past mean little canvas-flap operations where the proprietors sweated at their work under a dry Wyoming summer. As we rode through Green River’s streets, we came upon a small crowd gathered around an old Conestoga wagon. A man in a shiny stovepipe hat stood before it, shilling whiskey bottles filled with something inky black and viscous. “Cures a sore throat! Deadens pain! Seals over bullet wounds! Why it will even reverse God’s curse upon Eve and ease your childbirth!” He righteously pointed a bottle at a pregnant woman sweating through her bonnet. “Plague of locusts,” Samuel muttered. At last Samuel reined his horse up in front of a simple one-story building with a glass in the windows and the door. Paint in the window declared Walton’s General Store — fairest shake this side of the Missisipi! If Samuel noticed the misspelled sign, he said nothing of it. We hitched the horses at a post outside the plank walk running this side of the street. Thick road mud sucked at my boots as I scrambled for the safety of the planks. He was already through the door while I still scraped mud off my boot soles against the planks. Hurrying the process along, I started to scoot for the door. As I mud-slid past the window a sliver of sunlight snagged on something in the window. Within there was a wide array of goods displayed for sale. Fine hats, men’s jewelry, boxes of tobacco. None of that mattered a whit next to the centerpiece of the display—a fine nickel-plated Smith & Wesson Model 3 with ivory colored horn grips. My eyes widened over the way the daylight danced over its mirrored surface. That was a professional’s gun. That was a gunfighter’s gun. In my mind I saw Hickok’s famous duel in Springfield. In Hickok’s place I stood with the S&W at my hip. Across from me stood Barker Raleigh, the once-immortal bandit king I had watched Samuel slay only a month before. In my imagination we drew, but I was a hair faster. My hands were lightning incarnate. Invisible lead shot the gun from Raleigh’s hand, cracked the buckle from his belt, dropping his britches, and split the cigar in his lips. “You just named two of the most insufferable self-indulged men I ever met.” He looked down at me, his brows knitting together and I stared back up at him. “Thank you!” Before he could walk away I hugged him. It was my money, after all. Some time later I walked out again with Samuel, helping to carry the supplies for the trail—coffee, hard tack, jerky, a little bit of salt, and as many boxes of ammunition as we could afford. We resumed packing up. After I found room for my new clothes among the books of lore, the jars of dark substances, and bundles of rare dried herbs, I took the holster containing the S&W and donned it with a gentle reverence. The weight of it felt safe, even as its stopping power sent a worm of unease in my heart. “S’that look for?” Samuel asked as he glanced at me over the saddle of his horse. I nodded, absently rubbing at my hands. Samuel climbed into his saddle and I followed suit. No more was said on the subject. The weight was reassuring, and it was a very fine six-gun. We took a wide road leading north and started up. I eyed a passing cafe and another lunch counter, but I knew better than to ask. Samuel would say, “I’ve a mind we chew up the miles ‘tween us and Silverton than sit and stay.” So it would likely be biscuits and jerky eaten in the saddle and washed down from my canteen. I was so caught up in my visions of a hot lunch, I didn’t notice the crowd until Samuel drew to a stop beside me. “Huh?” I looked up, coming back to the world around me. A crowd was gathering at the behest of a man calling out to them. The crowd pulsed and throbbed with interest over it as he held aloft an amber glass bottle. I glanced at Samuel. He rolled his eyes and leaned an elbow on the horn of his saddle. “Use your eyes.” He gestured, reins still in his hands, at the man. The fellow with the bottle stood on a crate. Welldressed in a dark suit with a bowler hat. Something about his sharp, patrician face tugged at my recollection. And then I realized Samuel was gesturing to the garish wagon behind him. The crowd clamored, oohed, and awed in tune to the man’s jig. He continued to prattle off a list of diseases and conditions it could either alleviate or outright cure, including but not limited to measles, rubella, warts, heat exhaustion, and melancholy. Samuel chuckled at that one. A fellow who had been shading in the overhang of a hotel’s porch stepped off the plank walk and started toward the crowd. By the look on his face, you’d think the man’s horse had thrown a shoe. When I glanced at Samuel beside me I saw him taking in the man with cool interest. “This should be interesting,” Samuel said. While the man stalked toward the crowd Samuel pulled a slim silver case from his jacket and withdrew a cigar and a lucifer match. By the time a wreath of spicy, silver smoke started to hang about Samuel’s head, the man stopped. “Samuel, you’ve got to do something.” I turned toward him, my throat starting to clench tight. He rolled his eyes and drew the Remington. He drew back the hammer with a click. Sixty feet away, at the wagon, Quillburn was brandishing a bottle of Panacea at the crowd, trying to fend them off. There was not even a second between the discharge of Samuel’s pistol and when the bottle shattered, scattering glass and golden liquid into the air. Faces turned to us now, expectant. “The hell did you do that for?” Someone shouted. “You gonna stand in the way of justice, mister?” someone else said, coming forward. The new fellow rested a hand on a pistol slung across his waist cross-draw. Some men advanced on us, muttering more threats. Beside me, Samuel cleared his throat. “Good time to draw that lady’s dresser you call a shooting iron, kid,” he muttered. He stuck the cigar back in his mouth and casually held his pistol up. I thumbed the holster thong off my S&W and drew it as well. “There’s only two of you,” the would-be gunfighter said. “Sounds like fair odds,” Samuel said, conversationally. He inhaled deeply of the cigar and blew a thick plume of tobacco smoke. I had no idea how Samuel could be so calm about these things. My hands were sweating so hard I had trouble keeping grip of my pistol. Fortunately, we did not get to find out whether these were indeed fair odds. A sharp call from Quillburn once again drew the crowd’s attention. He was seated in his wagon and already it jerked into motion. With more urging, he had the horses up speeding north and out of town. Someone raised a gun to shoot but Samuel once more fired into the air. The gunfighter stared at Samuel and me. To help the point I lifted the gun and aimed at him. His eyes bulged. “You can’t take us all,” he said. “Don’t need to,” Samuel said, gesturing at the crowd. It had begun to disperse behind the gunfighter without his even knowing. He cursed and spat, and walked off kicking dirt. Riding on again, I glanced at the dispersing crowd. As we passed the gap between a saloon and a small gaming house I saw two men standing in the shadows of the alley. One was the brother of the unfortunate Jake. The second was the gun-slick with the cross-draw holster. Coming soon from 18th Wall Productions! On a sunny day in 1912, an eccentric book dealer named Wilfred Voynich walked in to a Jesuit college in Italy. What he purchased there would confound antiquarians, historians, and linguistics professors for decades to come: A 246 page book of apparent antiquity containing bizarre images of imaginary plants, bathing women, and occult diagrams. This archaeological curiosity would become known to the world as the Voynich Manuscript. To write is to read. In order to become a better writer, you must always have a book in the queue. Typically this advice falls in line with reading the style which you seek to write, but the same is also true of books which teach the practical, technical skills of writing. I have a bad habit of picking up books and keeping them on the shelf above my writing computer as if they are talismans whose very presence will impart great writing skill. But every so often I read a book that is so incredibly useful that it sticks with me. While this is by no means a replacement for a good writing course or an MFA, these books will help flesh out your skill set, tell you what to do once the first draft is done, or inspire you to greater heights. This is my (2017) top five list of books for writers. I write monsters. For Dead West I have to construct folk-lore terrors to stalk the majestically blasted landscapes of the American West. But I’ve also written my share of fantasy and science fiction, both of which require a thorough understanding of the monsters and monstrous antagonists that harrow the heroes of my books. Athans has created the book to help you understand your monsters. In a chapter-by-chapter breakdown, he helps you needle through their anatomy, their psychology, their strengths, and their weaknesses. My favorite part of the book comes in the first chapter where he provides a fleshed out worksheet for building your boogeymen. If you write genre fiction (or maybe even if you say you don’t), then this is a great book to keep on your shelf. “Samuel was so gosh darn angry. He was so angry he could spit.” “The sight of the bad hackerman made Dera very afraid.” We’ve all seen it. Sentences like these are the reason ‘show, don’t tell’ is the first rule for writers. Don’t tell me that Samuel was angry, show the gritting of his teeth, the rigidness of his limbs, the darkening of his brow. Of course, Hackerman made Dera afraid. But what did that fear do to her? What about the rising pulse in her throat, the dilated pupils, the beat of quivering sweat down her cheek? The Emotion Thesaurus is one book in the ‘Thesaurus’ series from Writers Helping Writers. I own three of the bastards, and I can recommend all of them. But I think this one is the most useful of the lot. Within you’ll find a list of the big ones for negative emotions, including the spectrum of anger, fear, and envy. Each entry will go over the physical signs of the emotion, what the character may experience internally, and ways that the emotion could escalate. Excellent stuff to avoid telling. There’s not much to say about this old standby. A new edition of this book comes out every year, with listings of agents, publishers, contests, paying markets, and more. Any writer who is looking to get paid for their work needs to keep a copy on their desk. The service is invaluable. I will sing the praises of this book! Take Off Your Pants is the single best book on the subject of outlining that I have ever encountered. It gives incredible detail on a method of outlining that is so much more brilliant than simply listing out a vague sketch of the order of events. Hawker, a highly regarded historical fiction writer, has put together such an interesting and unique view of the outlining process—a technique that emphasizes deep character building first and foremost. Of the books I’ve listed this year, this one is by far the most technical. I’m only a new convert, but she’s earned a fan for life by her work here. Hooboy. It was late 2010. I was in a job that was eating me from the inside out, and outside of a very happy marriage, I was emotionally in the lowest place I can recall ever being. An errant thought wandered into my mind: Why not try and pursue something I’d always loved, but never felt like I’d be able to do? Something I’d always talked myself out of? I stopped off at the local bookstore and picked up a copy of Stephen King’s On Writing and my world imploded. On Writing is only tangentially a book instructing the art of writing. Rather, it is a memoir that covers the topic in a brief touch. This is a beautiful book of inspiration. Because of its singular ability to capture and motivate me to write, it will likely always be the best book on the subject that I’ve ever read. If you’re on the fence about this writing thing, and you think you might want to take a go at it, this is a wonderful book to pick up and read. Or, even if you’re just curious about the head-space of a best-selling author. It’s a beautiful book, written from a very humble place. King does not take the time to brag, so much as to share with you the wonder and excitement of the milestones of his career. And he shares with you that great passion he has for the act, with the hope that you too will share in that love and passion. So, those are my top five writing books. Do you have any you’d like to recommend? Leave a note in the comments below, or hit me up on my Facebook or Twitter. I’d love to hear what books have helped you the most, and maybe they’ll help me too.